(low) voltage fun with 220V and everything below! Research, experiment, creation, inspiration, education, cooperation! 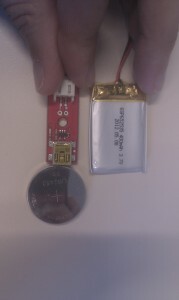 It consists of a Polymer Lithium Ion battery (3.7V) with a capacity of about 400 mAh and a LiPo Charger Basic – Mini-USB. Now, the question is if the button cell battery can be charged with the LiPo Charger Basic? Ellentriek #17: Hack your knitting machine with Knitic! The links and posts on Identi.ca pre-pump.io. Call for collaborators – Interactivos 15 – Material Cultures in the Digital Age.